I think those of us who love the idea of the republic, natural community, liberty, and proper order need to accept one extremely important fact: the American constitutional republic is most likely gone; the constitution has been dead since at least 1945; and there’s little to no chance of it ever reviving—at least not within our current geographical and political structures. The theological virtue of hope has not completely left me. As Edmund Burke argued so well, we are never authorized to abandon our country to its fate. As long as a heart still beats, he stated, the possibility of resuscitation exists. There are many, many good and moral folks fighting for a revived constitutional order. And, I want to acknowledge their excellent work. I think of Winston Elliott at The Imaginative Conservative, RJ Pestritto at Hillsdale College, Patrick Deneen at Notre Dame, Mike Church on talk radio, and a number of others. We can debate when a near fatal blow fell: when Jefferson purchased Louisiana; when Jackson forcibly removed the Cherokees and other tribes from their homelands; when Polk’s army raped Mexico; when Roosevelt concentrated thousands of Japanese Americans into camps; when Nixon lied to Americans about U.S. troops in Cambodia; when Ford forsook our Vietnamese allies; when Bush invaded Iraq; when Obama called in an air blockade of Libya from the beaches of Brazil. This list of possibilities is far from exhaustive. For years I’ve defended Abraham Lincoln’s decisions in 1861 and after, always trying to focus on the tragic nobility of the Civil War, and I’ve tried to keep a bit of a distance from the current secessionist crowd, especially those who parade around the Confederate battle flag. I am, after all, a Russian-German from Kansas, and my ancestors arrived well after the Civil War. And yet, something has nagged at me that I’ve not been able to define or clarify. Every time I hear that an individual state—most recently, Montana, Tennessee, and Texas—is trying to defy the federal government, a thrill runs through me. “Defy, defy, defy,” I think in the depths of my rather cacophonous and admittedly conflicted soul. Frankly, I find many of the pro-Lincoln scholars about as poor in quality as the anti-Lincoln scholars, each bringing corruption through preconceived, rigid ideological notions to the once sacred realm of scholarship. Each side is so often ridiculous as to demand ostracism or dismissal as simply silly. If they didn’t each hold such powerful positions in the worlds of academia and politics, we could do this with relative ease. But their very power demands we take their arguments seriously. Silliness, therefore, quickly becomes sadness when one realizes the level of scholarly corruption. I still think Lincoln was right in defending Fort Sumter, a federal fort legally created and owned by the feds since 1816, illegally besieged by South Carolinians in late December 1860. I also find the story of Robert Anderson’s defense of the manmade island one of the most inspirational stories in all of American history. The decision of South Carolina to secede in December 1860 and the decision by several states to follow after was a horrible mistake in almost every way. Challenging a constitutionally-elected president for being. . . well, constitutionally elected is not the best way to go, especially when the man elected is one of the most constitutionally-minded men of his day. Yes, that’s a lot of constitutionalism and unconstitutionalism. Without getting into the specifics of the history of the Civil War, suffice it state: 1) slavery finally ended (praise God); 2) nationalism reared its truly nasty head (which also hurt black Americans and, frankly, every non-Anglo-Saxon-Celtic Protestant peoples in the United States); and 3) secession became a synonym of and for racism in the American popular mind. No matter the cost, the Civil War might well have been worth ending the evils of slavery… but that’s not a debate in which I’m trying to engage here. In the American tradition, the idea of secession, or, more politely and with less emotional and tainted baggage, disunion, runs very deep. It’s worth re-examining this tradition. For the purposes of this post, a few thoughts and quotes might suffice. States as well as the Second Continental Congress declared themselves sovereign in the summer of 1776 by seceding from the British empire. After a long and bloody war of disunion, Britain eventually accepted American independence, presuming the republican experiment would fail. 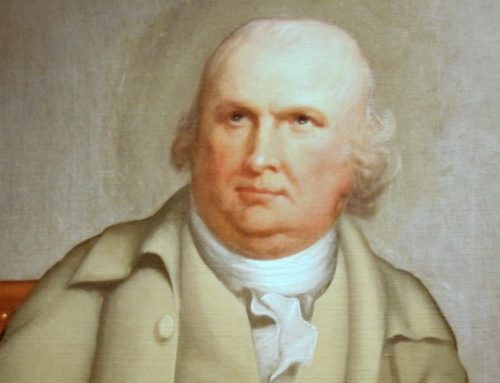 Throughout the Revolutionary War, those who advocated the sovereignty of the states bitterly fought with those who wanted some form of nationalist consolidation. The Articles were a mixed blessing, as under them Congress effectively won a war against the powerful British empire, and it introduced and passed arguably the most republican law in the history of the world (as our own John Willson has so admirably argued), the Old Northwest Ordinance of 1787. Under the Articles of Confederation, however, the Congress also failed to pay off its war debts, and it failed to stop a farming and tax rebellion in western Massachusetts. Further, men such as Alexander Hamilton argued, state officials held too much power and loved power for its own sake and not for the sake of their little republics. 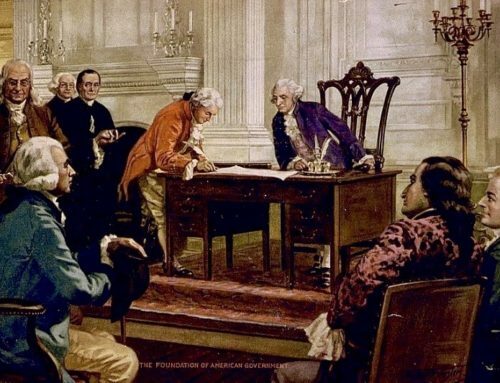 A compromise seemed to be reached between the two forces in the spring of 1787 with the call for a constitutional convention to revise the Articles. Even the means by which decisions could be made proved a compromise. Though the nationalists dominated the constitutional convention in Philadelphia in 1787, they could not win every issue. As it turned out, tellingly, each state represented at the convention received one vote. While the Constitution’s preamble spoke in the language of “the people,” the ratification process demanded that each state form a constitutional convention—separate from the state legislature which could initially vote for and later just as easily repeal its support—to ratify the Constitution itself. In other words, “the people” voting for or against the U.S. Constitution did not do so as a national aggregate of Americans, but rather as citizens of a particular state. Finally, as McDonald has pointed out, when the languages speaks of the United States, it does so in the plural. Even a nationalist as seemingly solid as James Madison offered conflicting viewpoints (or, at the very least, full of tension) on the relationship of the states to the federal government. We may define a republic to be, or at least may bestow that name on, a government which derives all its powers directly or indirectly from the great body of the people; and is administered by persons holding their offices during pleasure, for a limited period, or during good behaviour. It is essential to such a government, that it be derived from the great body of the society, not from an inconsiderable proportion, or a favoured class of it; otherwise a handful of tyrannical nobles, exercising their oppressions by a delegation of their powers, might aspire to the rank of republicans, and claim for their government the honourable title of republic. The message would not have been lost on the reading public. “A handful of tyrannical nobles” controlled the states, and only the federal government could intervene to protect the rights of the citizens of those states. Madison seems a slippery character, and it’s difficult to pin him down on certain issues. That this Assembly doth explicitly and peremptorily declare, that it views the powers of the federal government as resulting from the compact to which the states are parties, as limited by the plain sense and intention of the instrument constituting that compact, as no further valid than they are authorized by the grants enumerated in that compact; and that, in case of a deliberate, palpable, and dangerous exercise of other powers, not granted by the said compact, the states, who are parties thereto, have the right, and are in duty bound, to interpose, for arresting the progress of the evil, and for maintaining, within their respective limits, the authorities, rights and liberties, appertaining to them. Resolved.-That it be and hereby is recommended to the said Legislatures, to authorize an immediate and earnest application to be made to the Government of the United States, requesting their consent to some arrangement, whereby the said States may, separately or in concert, be empowered to assume upon themselves the defense of their territory against the enemy, and a reasonable portion of the taxes, collected within said States, may be paid into the respective treasuries thereof, and appropriated to the payment of the balance due said States, and to the future defense of the same. The amount so paid into the said treasuries to be credited, and the disbursements made as aforesaid to be charged to the United States. Resolved.-That it be, and it hereby is, recommended to the Legislatures of the aforesaid States, to pass laws (where it has not already been done) authorizing the Governors or Commanders-in Chief of their militia to make detachments from the same, or to form voluntary corps, as shall be most convenient and conformable to their Constitutions, and to cause the same to be well armed equipped and disciplined, and held in readiness for service; and upon the request of the Governor of either of the other States, to employ the whole of such detachment or corps, as well as the regular forces of the State, or such part thereof as may be required and can be spared consistently with the safety of the State, in assisting the State, making such request to repel any invasion thereof which shall be made or attempted by the public enemy. Considering the importance of the persons or moments just cited, it would be strange, indeed, to suggest that the idea of disunion, secession, nullification, and interposition (for the purposes of this article, I’m conflating these disparate but related ideas) was not a part of the American tradition as modern American nationalists (on the left and right) like to claim in this second decade of the 21st century. But, what strikes me most in 2012 looking back at these documents is how logical disunion is to the very nature, construction, and essence of a republic. If members have the right to join together voluntarily, they should also have the corresponding right (or “duty,” if Madison is to be taken seriously) to dissent as well. While there are a number of steps in between decision and final action, this dissent is best expressed ultimately by a complete separation. In the nineteenth century, one finds the most obvious appeals to a mystical American nationalism in the speeches and ideas of Daniel Webster and Abraham Lincoln. Neither appeal is fully logical, and when pushed to the end of their argument, each reaches for a faith in a America that best resembles a Medieval approaching the throne of God. In the end, the Webster and Lincolnian appeal to a secular faith is nothing more (or less) than just this, a claim of faith. It is sometimes said that nations are swayed by laws, as unfailing as those which govern matter; that they have their destinies; that their character and position carry them forward irresistibly to their goal; that the stationary Turk musty sink under the progressive civilization of Russia, as inevitably as the crumbling edifice falls to the earth; that, by a like necessity, the Indians have melted before the white man, and the mixed, degraded race of Mexico must melt before the Anglo-Saxons. Away with this vile sophistry! There is no necessity for crime. There is no Fate to justify rapacious nations, any more than to justify gamblers and robbers, in plunder. Lincoln’s “Mystic Chords of Memory” tragically becomes the blood-soaked fields of Shiloh and Antietam. What might the U.S. look like in Disunion? The Great Plains and parts of the Rockies were, for the most part, free trade areas, fee cities, religious communities, or Indian lands. If the U.S. did actually break up in or after 2012, I would expect some of this to be accurate, but not all of it. Perhaps the entire eastern/northeastern corridor, starting in D.C. and working its way north/northeast might form one government (probably not a republic). The southern states, Texas, Oklahoma, Kansas, and Missouri might form a republic. Texas, though, might well go on its own. The northern states of the Great Plains, Minnesota, Wisconsin, Montana, and Wyoming could form a union or join with parts of Canada. They might also confederate, ideally, with the previous grouping. Idaho probably wouldn’t survive, as it would be torn in at least two directions. The Mormon areas of Arizona, Colorado, Nevada, and Idaho would join together in new State of Deseret, centered in Utah. Hawaii would probably either ally itself with another country, or it might become a part of a Pacific nation of some kind. Problem states are Ohio and Michigan. If lucky, Indiana, Iowa, and Illinois might accept them into some kind of political union. It’s not beyond the realm of possibilities that some of the larger cities might either choose or be forced to become independent city-states. One can imagine, for example, Illinois voting to rid itself of Chicago. Anyway, these are all, of course speculations. Once disunion begins, it’s incredibly difficult to know where it might end. Lincoln might very well have been correct when he suggested that secession is the essence of anarchy. But, frankly, at this point in American history, a little anarchy might very well be preferable to Leviathan. One objection to all of this, one might claim, is that it violates the very spirit of the founding, what our soldiers have given and sacrificed, etc., over the centuries. I think, however, it would be even more true to state that the nationalists have violated the spirit of the American republic, in its form as well as in its essence. I would go so far as to state that it is impossible to have a nation and a republic simultaneously. A nation demands just as much centralization as republicanism demands decentralization. For now, of course, all of this is just fantasy. But, it’s worth considering, and it’s worth considering sooner rather than later. If the dignity of the human person (male, female, black, white, Asian, gentile, Jew. . .) is to be respected, preserved, and augmented, it will not be so under the existing American federal government. In terms of support of the wealthy (stimuli packages), the growth of the secretive security state, and the decline of American civil liberties, look to the federal government. In every single way, it has become increasingly oppressive. Each political party is guilty—either from sins of omission or commission—and, from the perspective of a constitutionalist, there really is no constitution left. There is also little (but hope is still not vain) possibility of revival of the one we have—at least not within the existing geographical structure of the U.S. And, if there is a revival, it will come probably not from politics or political science or think tanks or any of the other ephemera of the world. It will come from literature, liberal education, and a proper understanding of man. There’s probably no stopping Leviathan from within any longer. But if we could simply walk away from the oppression that continues to engulf us and emasculate us, life might just be a bit freer and more humane for our children and their children. There’s almost no chance of secession to succeed, but it’s probably worth the effort. It’s a terrible and telling comment on America that we can not imagine a state or region or city or area leaving the U.S. without a massive reaction of American military forces. When Quebec almost left Canada over a decade ago, no one expected violence. The same could never be said of a similar movement in the U.S. But I will conclude with this thought. If the soul was once the Constitution, America’s body is nearly corrupt beyond redemption, would it not be best to find a healthy body for the soul to thrive? Any chance you still have the manuscript for that Western? I imagine it would sell a few copies in the HC bookstore. Every time I go home to see my parents in Texas, my dad or brother makes some joke about secession. I'm no particular fan of Texan culture–I'm truly a son of the Midwest–but I will give them this: they're the only place (except maybe Arizona) where I could envision secession gaining any momentum. Not only has the federal government expanded to unimagined proportions, but the effect of that expansion has been just what de Tocqueville prophesied: political sloth. We the people are so accustomed to aid and intervention from the Leviathan that we'd rather not live without it. It's just easier that way. I don't think there are many states or even regions that contain the spirit to muster unified defiance. Well said. Alas, I fear the cancer known as Leviathan will kill the host before a cure is found. I too, however, believe that the effort is necessary for the sake of our posterity and those who follow? I see your U.S. breakup scenario omitted Washington and Oregon. Just as well. I tremble to think what sort of government our sophisticated leaders would form in the absence of a national government. I tremble further when I realize that it would have nuclear weapons. It is interesting to compare Madison’s vision of federal power as a counter-balance to state tyrannies, against the 1970s debate on federal Europe. In the mid-1970s, Britain’s government was led by its Conservative Party, headed by the largely socialist and wholly Europhilic Edward Heath. Then, as both earlier and today, the Europhiles of all parties quietly wanted a superstate run by an unelected bureaucracy; a clear-headed (if undesirable) notion that party-political differences are small compared to their common desire for an ever-expanding government in the hands of Progressive, statist apparatchiks. But back then, even the true-blue, real conservative rump of Britain’s Conservative Party wanted more European integration: not only for a classically liberal ‘Common Market” in goods and services to replace tariffs and trade skirmishes, but as a method to check Britain‘s advance toward socialism and industrial nationalisation that was far ahead of the continent at the time. So early Thatcherites, UK Reaganauts, and even a few Burkeans of a tactical bent, supported stronger central power to slow the worst excesses at home; ignoring the Scots proverb that who sups with the devil needs a long spoon. Two continents, identical bad choices, and identically nasty chickens coming home to roost but on converging timetables. Yet to disagree mildly with Brad, America’s soul was never its Constitution. Its Constitution was its underwear; designed to reflect and preserve American values, covering and minimising the naughty bits that we all knew existed. It was good underwear too, preserving American modesty, behaviour and good intentions until cultural and political decadence convinced many that it was more desirable to run around buck naked. But even the most noble scrap of paper, or the best-knit BVDs, must not be mistaken for a beautiful if fragile soul. Souls defy easy description while a page of paper can contain almost any ideology. Beautiful, grand, manly writing. THIS is the type of literature truly heir to the moral virility of Kirk, his anti-conformism and assertion of supremacy of ethics over mere “bios” and terrain tribal stupidity. American conservatives (so unlike your average pedestrian “FOX-News” pretentious tool the commons mistake as quintessence of “conservative” – we also interrelated to matters, face a question of political self-styling… “Revolutionary-conservative”, “revolutionary-reactionary” or “conservative-revolutionary”, etc. simply seem what honesty demands at this point… What have we to do with the likes of FOX News and the bloated economic right of amoral pluto-pornocracy? What does Kirkean genuine ethically-classicist, ontological-teleological conservatism enjoy in common with mainline “Republicans”…? I dare not even shake the hand of a Republican these days, surely! Rotted is entire system, I apologize to announce, friends… Words and games are ending, thankfully… Battle-formations and war-demarcations likewise happily are taking shape. Is this ecstatic nihilism of Juenger? NO. Only combat-readiness for the metaphysical conflict. As above-stated the Republic is now almost certainly fallen. Invisibly as the Roman twilight. I pray violence to be absent. But I know life, too. Weimar is surpassed. I cannot predict the future. God protect the remnants of the pure heart surviving in the American NAMELESS BEAST. To add a little cynicism to the discussion, it appears that every section of the U.S., be it the South or the North, has alternately favored nationalism or state’s rights based on what would benefit them at the time. The Northeast wanted secession during the War of 1812 but didn’t want it during the War Between the States. James Madison argued for nationalism during the constitutional debates but against it in 1798, then for it again in 1812. John C. Calhoun displayed similar flip-flops. I know supporters of these men have justifying explanations for these changes, but rare is the person (John Randolph?) who remains consistent in opposition to nationalism or vice-versa.